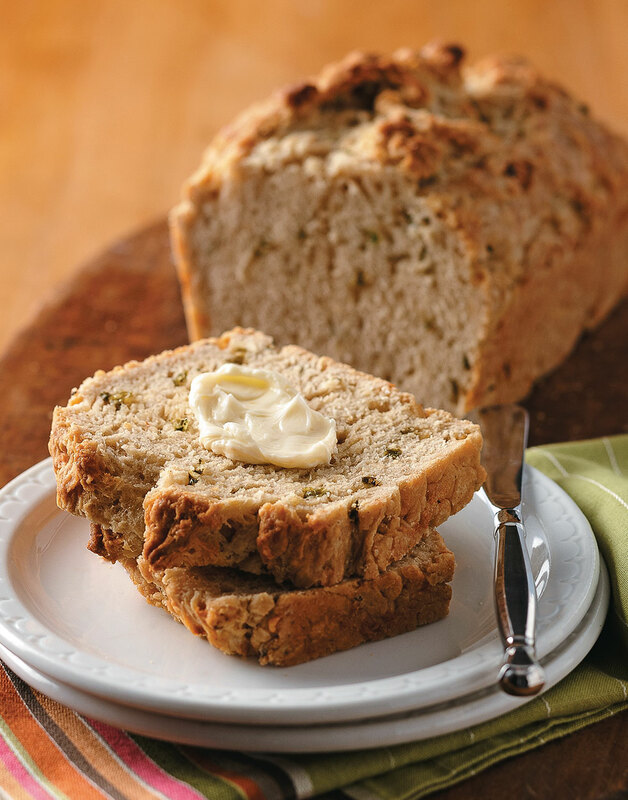 Before New Year’s revelry of any kind begins, make this Golden Beer Bread. It only benefits from letting the flavors of the chiles, beer, and cheese meld for a day. When ready to serve, just slice and eat (it goes great with the Black-Eyed Pea Chili Verde), or toast it and slather with butter. Preheat oven to 375°. Coat a 9×5-inch loaf pan with nonstick spray. Sauté onion and jalapeño in oil in a skillet over medium heat, until softened, about 5 minutes. Add garlic and cook 1 minute. Whisk together flour, sugar, salt, baking powder, and pepper in a bowl, then form a well in the center. Add onion mixture, beer, and cheese to well; stir until combined (batter will be thick). Transfer dough to prepared pan; smooth top with a spatula. Brush 1 Tbsp. butter over dough and bake 35 minutes. Brush loaf top with remaining 1 Tbsp. butter. Bake beer bread until a toothpick inserted in center comes out clean, about 30 minutes more. Cool bread in pan 5 minutes, then turn out bread onto a rack to cool completely, 1–2 hours.